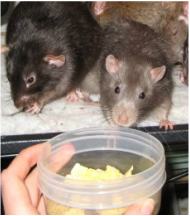 ​It is useful to sometimes offer your rats a wet meal, which usually means something that has been cooked or has had more preparation done to it. These are particularly useful for putting supplement in, bulking up the old or infirm, or topping up youngsters with extra protein. They are also generally much appreciated by the rats so replacing part or all of their dry mix every week to 10 days can be a nice treat. 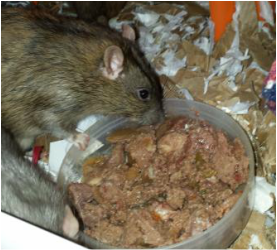 Feeding wet meals too often, even replacing part of the dry mix, can cause issues unless the rat is struggling to maintain a healthy weight as they are much more digestible than normal so can easily cause weight gain. You also need to make sure that the wet meals you feed are at least roughly balanced, this means they will be healthy and not upset the overall balance of their diet. Whilst the occasional share of your roast dinner or cheese on toast is a nice treat, this shouldn’t be a regular occurrence and should be kept for a very occasional treat. Dog / Cat food - Aim for the senior variants for adults and oldies and the higher quality brands so there aren’t so much rubbish and fillers in. Natural ranges are usually better. I particularly like the burns penlan farm range for older rats. For youngsters higher protein kitten and puppy food is very useful. Egg food - Sold for birds and parrots this is biscuit pieces soaked in egg, so are relatively high carbohydrate and protein. They are particularly useful as keep for a while and can be made up with warm water, lactol or milk for variety. Insectivorous feast is a particularly nice one as it is lower in sugar than most. Rat Rations soakable mixes - Rat rations do a nice range of soakable mixes aimed at different age groups and needs. This can be soaked in water, milk, baby food etc. and are generally well liked. Bulking up with some complan or coconut cream can help if a rat is a bit underweight. 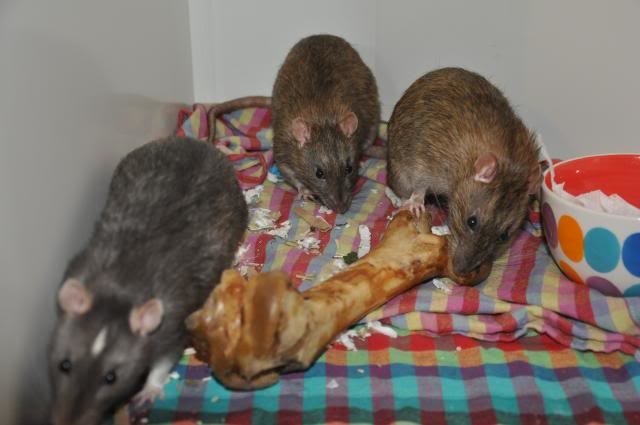 Some rats prefer a bit more texture in their food so adding in some human breakfast cereals can encourage eating. Shell fish (plus shells) with noodles and veg. Protein Sources (5-10%); Flaked Soya, flaked peas, egg food, broken up dog food (helps it soak faster), broken up pelleted food. Cooked bones - full of calcium and minerals (if they've got there marrow in still), note: chicken bones are fine too.